There was a disappointing and perhaps predictable end to 2015 for Heath and their hard-core band of supporters after a 32-10 defeat at Scarborough yesterday. The North Dean men rarely rise to the occasion at the splendid east-coast ground and they were below par again under floodlights in a game put back to a planned 3pm start. They trailed only 5-3 at half time but Scarborough then took advantage of the wind and Ben Hinsley’s sin-binning to take control. Sam Pollard was a late withdrawal so Jack Crabtree stepped in at fullback with Ezra Hinchliffe moving to centre for Heath’s first game in December. In good conditions, Heath kicked off with the wind at their backs and were quickly in the home side’s half and a clever kick from Crabtree had Matt Baxendale chasing through. Heath had control of the scrums with Daz Neilly, Howard Hanks and Josh White to the fore and the visitors threatened in the first ten minutes. Following injuries to two Scarborough players, the home side conceded a penalty but Hinchliffe was just wide on 13 minutes. Si Brown and Fergus Marsden made ground as Heath probed for a breakthrough but on 20 minutes Scarborough made their first foray into the Heath 22 and scored an unconverted try from a rolling maul. Heath came back strongly and Alex McFadden and White were instrumental in setting up attacks that resulted in a penalty on 27 minutes, Hinchliffe making it 5-3. However, once more against the run of play, after a Scarborough centre broke through and the ball was moved to prop Wesley Langkilde for a second unconverted try after 37 minutes. A quickly taken penalty by Dom Walsh set up Hinchliffe for a run and Sid Sales became involved as Heath pressed for an opening but Scarborough stood firm. Referee Mike Ramsden was left on the ground following an accidental collision but was able to continue in the second half after attention. Heath made changes but Scarborough showed how to use the conditions and when Hinsley was yellow carded for an intentional foul, they increased their lead to 13-3. 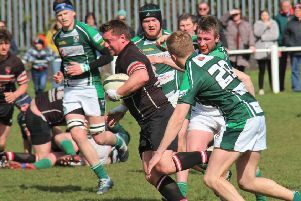 Heath had lost their way and on 48 minutes Scarborough stormed through for their third try, which was converted. From the restart, the ball travelled 10 metres but the wind blew it back and Scarborough took advantage to score their bonus-point try, stretching their lead to 25-3 on 52 minutes. A reshuffle prompted improvement from Heath and an excellent run from Baxendale spurred the team into action. Walsh touched down following good work from White and Hinchliffe’s conversion narrowed the gap to 25–10 with 20 minutes left. However, uncertainty at the restart let Scarborough in for a soft try. After an altercation, Scarborough’s number 16 was sent off but the try was converted. Ill-discipline kicked in and Heath lost their focus, being unable to take advantage of a flurry of home yellow cards. Heath will have to play better in their next match at home to leaders Bradford & Bingley on January 9.